I’ve been thinking lately about what I’d tell someone who said they wanted a German shepherd puppy. Obviously, I’ve become a fan of the breed, even though I never intended to become one. German shepherds just kind of happened to me. But in my time raising Pyrrha, fostering German shepherds, and now rearing our new GSD puppy, I feel like I’m beginning to learn about the many nuances of the breed. A GSD is not a golden retriever. Sometimes I feel like many people assume that a lab/golden retriever is just the default “dog personality” (e.g., gregarious, every person is their best friend). Obviously, this is not true for every GSD, but shepherds tend to be “one person” (or “one family”) dogs. Your shepherd doesn’t think that every person she meets is her best friend, and that’s part of her heritage. Shepherds are a bit suspicious of strangers. Also be prepared for your shepherd to pick someone to be her person in your family. (In my family, Pyrrha unequivocally picked me. Guion almost doesn’t exist in her universe.) This can be saddening, but it’s also a trait of the breed. Beware the land sharks! GSD puppies have earned the moniker “land shark” for their mouthiness. It comes from somewhere deep in their herding heritage, I suppose, but these are very bitey puppies! For this reason, a GSD can be a trying breed with young children, who often become unwitting targets for playful biting. Start teaching your puppy right away that biting humans is inappropriate behavior and channel that mouthiness into heavy-duty chew toys and games that don’t involve tasty human hands. Be watchful for signs of shyness. Many GSDs, especially American-line dogs bred for show/companionship, tend toward shyness and anxiety. If not addressed, this shyness can transform into fear-based aggression. For this reason, socialize that puppy from the minute he comes home with you, and don’t stop throughout his lifetime. Hope you love dog hair… everywhere. There’s a reason people call them “German shedders.” Enough said! GSDs have a double coat, which equals twice as much fur all of your floor, your sofa, your clothes, etc. You also can’t win with your wardrobe; if you end up with a classic black-and-tan German shepherd, they have black, brown, tan, and sometimes white hair on them, so no color of clothing is immune! GSDs like to play rough. Shepherds have a tendency to rough-house with both people and other dogs. They’re intense animals! They don’t have the “soft mouths” of retrievers or the delicate playfulness of smaller breeds. Dog owners with other breeds have told me that it took them a while to realize that our shepherds were playing with their dogs — and not trying to kill them. In my experience, even in play, shepherds like to go for the throat and get into some heavy-duty wrestling. Supervise their interactions with other dogs, and help your shepherd take lots of breaks and time-outs so that the play doesn’t get too overwhelming. Get ready for negative public perceptions. Thanks to the media, history, popular culture, and surely many mishandled dogs, German shepherds don’t exactly have the best public image. If it hurts your feelings that some people are automatically scared of your dog, a GSD may not be right for you. If you have a GSD, let this motivate you to make your dog a great breed ambassador and help change negative stereotypes. Be prepared for a potentially vocal dog. GSDs also have a tendency to be vocal. We’ve had some dogs who were just whiners; they whined for a variety of reasons (excitement, unbridled joy, stress, to get attention, to get food). Other dogs were more bark-y, especially at strangers walking past our fence or at other dogs. 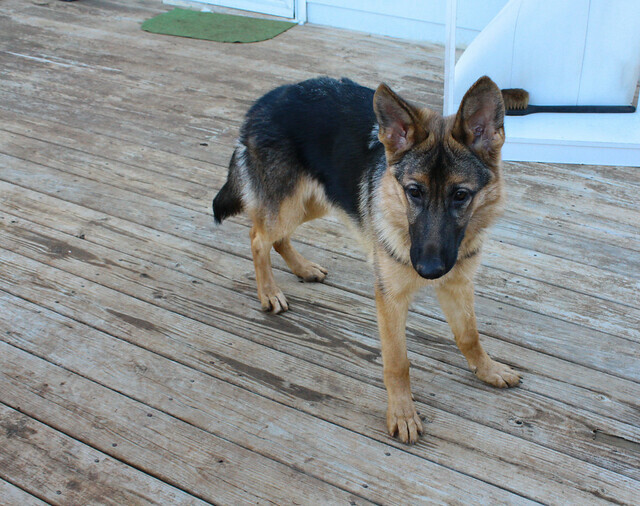 Pyrrha is an uncharacteristically quiet GSD; but our little Eden loves barking, barking just for the fun of it! Barking can be a very difficult behavior to curb, especially if it’s woven into a dog’s lineage, as it has been with shepherds for a while now. Be aware of this issue, and be prepared to start training your dog when and how to be quiet. Consider the large number of health issues. German shepherds are famous for their litany of health issues. On a range from more benign (allergies) to life-threatening (osteosarcoma, hemangioma), shepherds seem to have them all. The breed even has predispositions to diseases that seem to occur exclusively within the purebred line (e.g., degenerative myelopathy, which was once called “German shepherd neuropathy.”) It’s heartbreaking, but it’s a reality if you want a shepherd. Find a good vet (preferably one with shepherd experience), and start taking measures to keep your shepherd trim and healthy. Start brainstorming now about how to keep your puppy’s brain engaged. Otherwise, you are going to have a little terror on your hands. 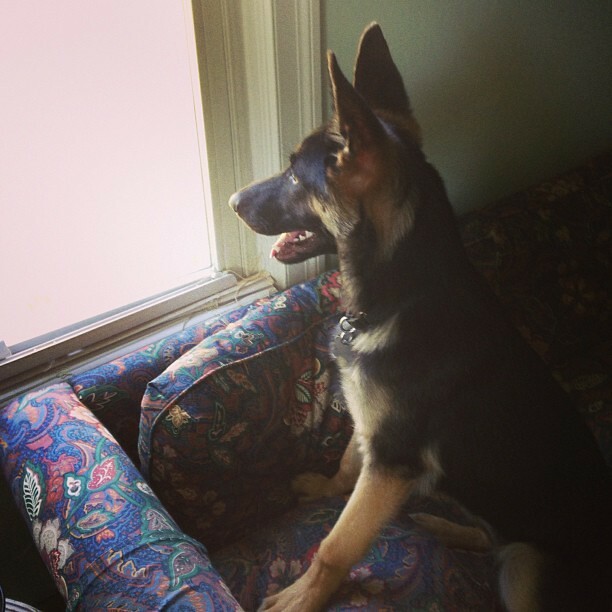 German shepherds are large, active, athletic, and highly intelligent dogs. What this means is that if they get bored, you are going to seriously regret bringing this fuzzy monster into your house. A smart dog with no job to do = a mischief-making tornado. Try obedience classes, agility, flyball, schutzhund, herding, nose work, etc. Shepherds can excel at many canine sports and activities! 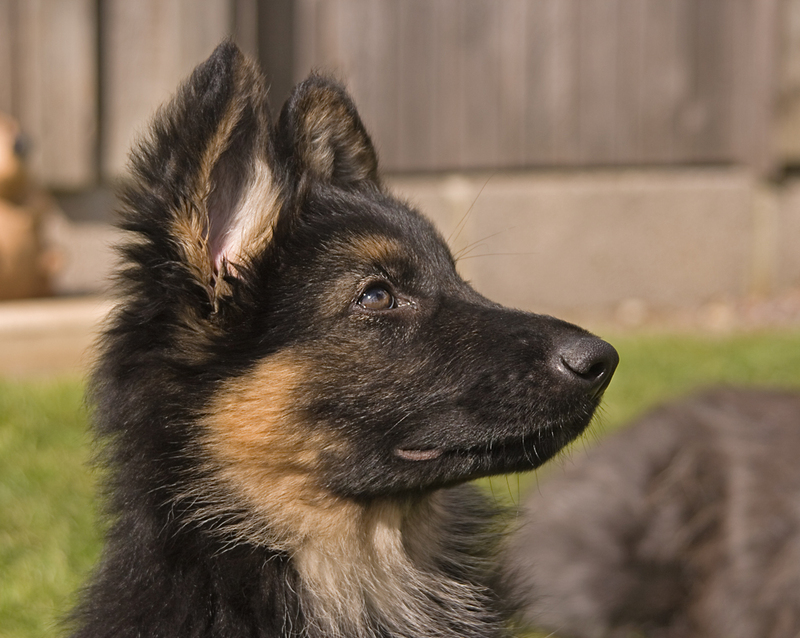 If you want a purebred puppy, do your research about the difference between working-line and show-line GSDs. You may be surprised to learn that there’s a large difference within the GSD breed between dogs who are bred to work and dogs who are bred to win show ribbons. This can be a touchy subject for some, but in general, I feel that the bottom line is this: Working-line dogs are sounder and healthier, because they are bred to do a job. Show-line dogs are just bred to look pretty and meet the sacred “breed standard,” which has morphed into requiring these horribly exaggerated hocks and back lines, which puts strain on the hips and wreck the dog’s gait. This post is a great introduction to the topic of working-line vs. show-line German shepherds, and it’s an excellent place to start. There’s also working-line breeder Christine of Blackthorn Kennels, whose shepherds even compete in herding. The downside of a working-line dog is that they are INTENSE, and they can be unsuited for a quiet urban or suburban lifestyle. Start researching now to determine what kind of GSD suits you and your family. Breeders aside, I’m a huge advocate for RESCUE. Obviously. Both of our (purebred) girls are from a rescue, and we’d encourage anyone who wanted a new dog (or a puppy) to look at a rescue first. We adopted from Southeast German Shepherd Rescue, which covers North and South Carolina, Virginia, DC, and parts of Tennessee, Georgia, and Maryland. The only downside of rescuing a purebred is that you have no health guarantees and no knowledge of their parents (or often of their backgrounds). Pyrrha, for example, appears to be an American-line shepherd bred for companionship by a backyard breeder. The fact that she has surprisingly straight hocks and a level topline makes me think she wasn’t bred to win show ribbons, which I am thankful for. Eden, on the other hand, is a German-line shepherd whose parents were imports titled in schutzhund. They were also show dogs, so she has a more sloped topline than Pyrrha and slightly more exaggerated hocks. Here’s a listing of German shepherd rescues by state. German shepherds still rank no. 3 in popularity in AKC registrations, so there are lots of German shepherds all over the country, and thus lots of beautiful, great dogs who need forever homes. Consider it! Truthfully, a German shepherd puppy isn’t going to be that different from any other puppy. ALL puppies require hard work, devotion, and lots and lots of patience. But the joy they bring? That’s hard to reduce to an 11-point list.